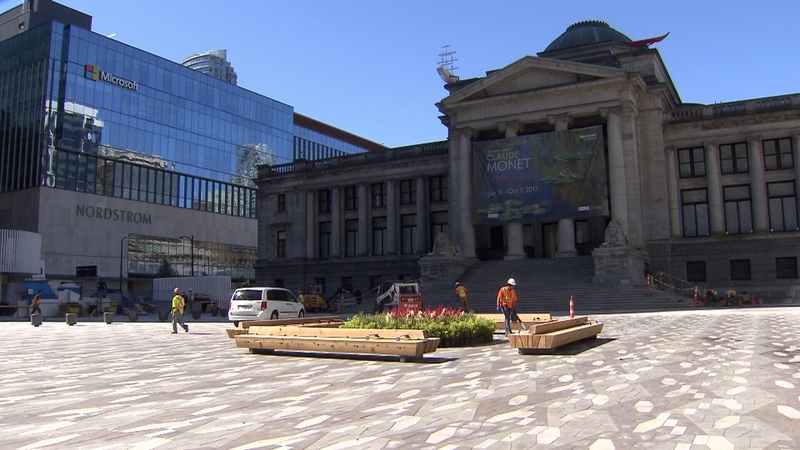 The Vancouver Art Gallery’s north plaza has reopened to the public after undergoing a $9.6-million renovation. Changes to the plaza, which is bordered by Howe, Hornby and West Georgia streets, were intended to make it less susceptible to the wear and tear caused by events held at the downtown landmark. The bark mulch covering much of the iconic plaza has been paved over with an intricate stone pattern. The plaza’s original grass lawn was replaced before the 2010 Olympics, but locals continued to refer to the space as the “art gallery lawn” for years after. The water fountain that was once the centerpiece of the space has been replaced with a collection of potted plants surrounded by benches. A new pavilion added to the Howe Street side of the plaza will shelter people waiting for buses. The structure could also house a tourist information booth in the future. The work began more than a year ago, and took several months longer than expected to complete due to unusually harsh winter conditions in the city. Some, however, are unhappy with the changes. Over the years, the area has been a key venue for a variety events, from food truck festivals to major protests such as Occupy Vancouver and 4/20 pot rallies. The city estimates 1,000 people could now congregate at the plaza. The first event to be held on the renovated space will be the Vancouver International Jazz Festival, which starts on Saturday. The south side of the gallery is also set to undergo a similar facelift. Last year, the city permanently shut down vehicle traffic on Robson Street between Howe and Hornby streets. Crews are expected to level the street and turn Robson Square into a permanent public plaza. 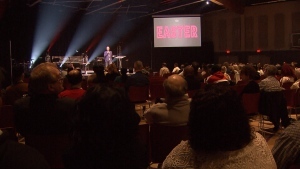 The estimated cost of that project is $6.4 million, but the city has yet to provide information on the final cost or timing of the renovation. The renovated plaza on the north side of the Vancouver Art Gallery is seen in this photo from Thursday, June 22, 2017.